A court-appointed guardian for Sara Duzan and a psychologist appointed to oversee the guardianship have both declined to release clinical records about Sara’s care to her family, with each saying it is the other’s responsibility to provide them. The family has been seeking the records to verify a claim made by the guardian, Lynne Turner, that Sara has “has been progressing very well” in recent months in a group residence operated by Becket Family of Services, a corporate provider funded by the state Department of Developmental Services. Turner has forbidden the family from communicating with Sara since November and from visiting her since last July, when she was first placed in the Westminster residence by Turner. Members of the Duzan family say they are concerned that Sara has been subjected to abusive physical restraints and seclusion at the Becket residence, but that they have had no way of knowing what Sara’s care and living conditions really are. Both Turner and Andrea Barnes, a clinical psychologist, who was appointed in July 2013 as a Special Master in the probate court case, have each contended in emails and letters in recent weeks that it is the other’s responsibility to provide Sara’s clinical records to the family. Sara, now 22, has a rare genetic disorder called Smith Magenis Syndrome, which is characterized by intellectual disability and behavioral outbursts. The Duzans lost their guardianship of Sara in 2009, stemming from both an admission by Sara’s mother, Maryann, that she once slapped her daughter on the cheek, and the conclusion of a probate judge in 2010 that the family had been uncooperative with providers in caring for her. Maryann said she slapped Sara on the cheek on one occasion in 2009 while Sara was acting aggressively towards her. 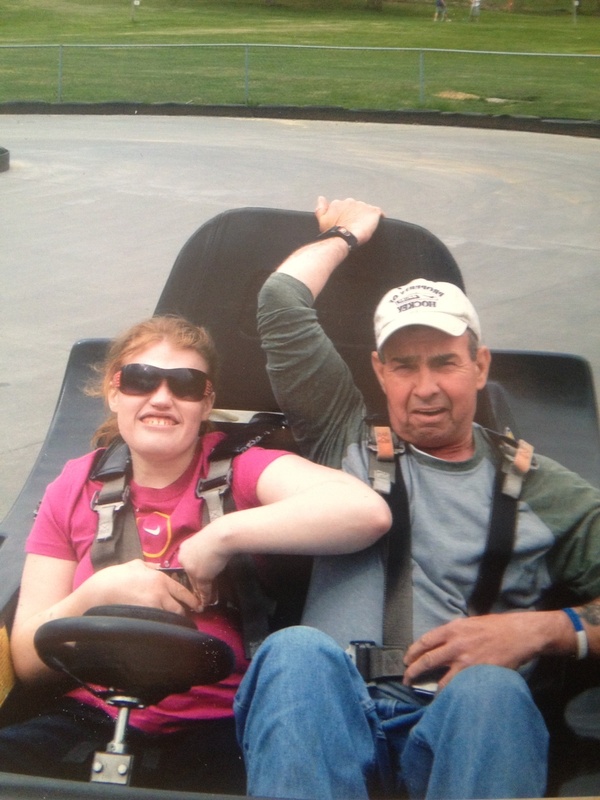 Sara Duzan with her father, Paul, on an outing a couple of years ago in western Massachusetts. The family is no longer permitted any contact with Sara, and has even been denied access to records of her care in her current DDS-funded residence. Thomas Frain, an attorney for the Duzan family, initially wrote to Turner on January 10 of this year, requesting Sara’s medical administration records, behavioral plan, records regarding restraints, shift notes and other clinical records concerning her care in the Becket residence. Frain is also the president of COFAR’s Board of Directors. Turner initially responded to Frain’s request with a letter, dated January 12, in which she stated that she would produce the requested documents if she was first paid $10,000. Her letter stated that her requested payment consisted of $5,000 for producing the records themselves and $5,000 in back payments for her work as guardian. Turner, who was appointed Sara’s guardian in December 2011, has billed the Duzan family for her guardianship services, but the family has declined to pay her, contending the court order under which Turner was appointed contained no provision for payment of her. The Duzans also contend that Turner has not been acting in Sara’s best interest by keeping her in the Becket residence and by cutting off the family’s communication with her. I also asked in my email to Turner and Barnes whether either of them had yet visited Sara in her residence since she was placed there by Turner in July. I have so far received no reply to my message from either Barnes or Turner. Turner stated in a guardianship report to the probate court in December that she had not yet visited Sara in the Becket residence. For her part, Barnes stated in a November 25 email to Maryann and Paul Duzan, Sara’s father, that she intended to visit Sara at Becket “sometime in the next few weeks.” The family says they have received no indication that Barnes has done so. The only clinical records the family has seen regarding Sara’s care at the Becket facility has been a clinical report, which Turner forwarded to the family in December along with her annual guardianship report to the probate court. That report stated that Sara was continuing to be restrained and placed in seclusion in the Becket residence through the month of November. Both Turner and Robin Thompson, a clinician at the Becket residence, have maintained that the Duzans violated a telephone protocol established for them, which expressly forbade them from discussing visits home or whether Sara was unhappy at the facility or its treatment of her. Sara was also specifically prohibited from talking to her family about any “dislikes about staff, residence, Becket,” or about restraints. Maryann Duzan says that she and other family members were allowed only six calls to Sara between July, when she was placed at the Becket residence, and November, when their communication with her was cut off; and in each call, Sara indicated that she was being subjected to either poor conditions, abusive restraints, or, in two cases, assaults by a staff member. Maryann says she believes the strict limits placed by Becket on Sara’s ability to communicate contributed to her behavioral outbursts. “Sara has apparently only been allowed to use a phone there six times in eight months,” Maryann says. “She has been denied the ability to report what is happening in her life to her mother and father.” Maryann adds that while she lived at home, Sara would make at least a dozen calls a day to friends and family members. “Sara is very verbal and social,” she says. Turner also contended in her February 2 letter to Frain that the Duzans had violated the law by recording conversations “with various parties without their consent.” She provided no further details about that charge. Maryann contends that she and her husband tape recorded one phone conversation with Sara in September because Sara had told them she had been assaulted by someone on the Becket staff. Maryann says no one else was recorded in the conversation. She says she turned the tape recording over to the Westminster Police Department after Sara implicated a staff member in the house as having punched her. In January, both the Duzan family and COFAR contacted the Massachusetts Disability Law Center, a federally funded legal advocacy organization, seeking an investigation of Sara’s care at the Becket facility and the circumstances surrounding the cutoff of the family’s communication with her. In response, a DLC attorney began visiting Sara in the Becket residence earlier this month. Maryann Duzan said the DLC attorney is further attempting to restore the family’s right both to communicate with Sara and visit her. The July 2013 probate court order appointing Barnes as Special Master stated that the family “should be invited to all meetings where decisions about Sara’s services will be made or discussed.” Maryann says the family, however, was invited only to one such meeting scheduled in early November. She says Barnes cancelled the meeting after Maryann and her husband indicated they wanted to bring their attorney to the meeting. Maryann adds that the family had been informed the purpose of the meeting was to discuss placing further limits on their communication with Sara. We have written several times about this case because we believe it raises troubling questions about the power of court-appointed guardians and state-funded corporate providers to overrule families in the care of persons with disabilities. In this case, a family that has been described as “loving” by a probate court judge, has been denied all communication with their disabled daughter for months and has even been denied access to clinical records that would give them an indication of their daughter’s level of care and well-being. The family is being kept in the dark about their daughter, and unless an outside agency such as the DLC is successful in intervening, there may be no end to that darkness. Thus far, it seems to us, the entire system has been stacked against this family. Even the probate court’s attempts to level the playing field do not appear to have worked. Barnes, the Special Master, was given the power to overrule the guardian with respect to “Sara’s medical, therapeutic, residential, day program, social and familial matters,” but she has never done so. Moreover, in her February 3 email to Turner concerning Frain’s request for the records, Barnes advised Turner to “take whatever is presented by him (Frain) with a grain of salt.” That is an unfortunate statement coming from a Special Master in this case, who was appointed to that position to resolve impasses between the family and Turner. Barnes is supposed to be a neutral party in this case, but her statement that one side in the dispute should regard the other side “with a grain of salt” appears to call her neutrality into question. Note: Do not let the people in the governor’s office tell you this is a probate court matter and there’s nothing the governor can do about it. The DDS has long been a party to this case and has fought to limit the Duzans’ rights and involvement with their daughter. More than 550 executives working for some 250 state-funded corporate providers of services to people with developmental disabilities in Massachusetts received a total of $80.5 million in annual compensation as of Fiscal Year 2012, based on nonprofit federal tax reports surveyed by COFAR. The average compensation among all 559 executives surveyed was $143,969 per year. Among CEOs, the average compensation was $185,809, while executive directors were paid an average of $127,164 in salary and benefits. According to the COFAR survey, provider executives making over $100,000 a year on average included 97 executive directors, 92 CEOs, 71 chief financial officers, 31 chief operating officers, and 83 vice presidents. CEOs or presidents of 14 providers made over $300,000 each. COFAR has long been critical of efforts by the Patrick administration and the Romney administration before it to outsource residential and other services to providers without adequate oversight of the growing privatized system. The system appears to have become top-heavy with corporate executives who do not provide direct-care services, but who nevertheless draw large salary and benefits packages. Most of the providers surveyed are under contract to the Department of Developmental Services, which manages or provides services to people with intellectual disabilities who are over the age of 22. Frain noted that DDS pays more than $1 billion a year in contracts to service providers, which operate group homes and provide day programs, transportation and other services to tens of thousands of intellectually disabled persons in the DDS system. State regulations capped state payments to provider executives at approximately $149,000, as of Fiscal Year 2011. The average compensation among the surveyed executives was slightly less than that amount. Money earned by executives above the state cap is supposed to come from sources other than state funds. But while the state cap on executive salaries is intended to limit the total amount of state funds going into the pockets of provider executives, COFAR has reported that the state may not receive complete information on the total compensation paid to provider executives and may not have the capacity to oversee their finances adequately. Also, COFAR has raised concerns that increasing amounts of money going to provider executives has not translated into higher pay for direct-care workers in Massachusetts. The state auditor reported last year that in one case involving the May Institute, a DDS provider, hundreds of thousands of dollars in state funds had been paid to company executives in excess of the regulatory cap. COFAR’s executive compensation survey found that the May Institute CEO received $404,900 in compensation in FY 2011 and that a total of 12 company executives were paid a total of $2.5 million that year. At $404,900, the May Institute CEO was the fifth highest paid CEO on COFAR’s list. Community Systems, Inc. topped the COFAR list of the highest paid CEOs, with two employees listed on the company’s federal tax filing as serving as company CEOs in FY 2011 and drawing combined compensation of $526,755. Second on the list was Morgan Memorial Goodwill, whose CEO was listed as making $464,572 in FY 2012. Community Systems federal tax filing states that the company, which is based in Forestdale, MA, took in $14.4 million in revenues in Fiscal Year 2011. Of that amount, the company received $11.6 million from DDS, according to a 2011 financial report filed with the state’s Operational Services Division. In addition to the CEOs listed on the Community Systems federal tax report, two employees were listed as executive directors of the company that year and made a combined total of $276,538. The OSD report lists the two executive directors of the company as having made only $154,473. 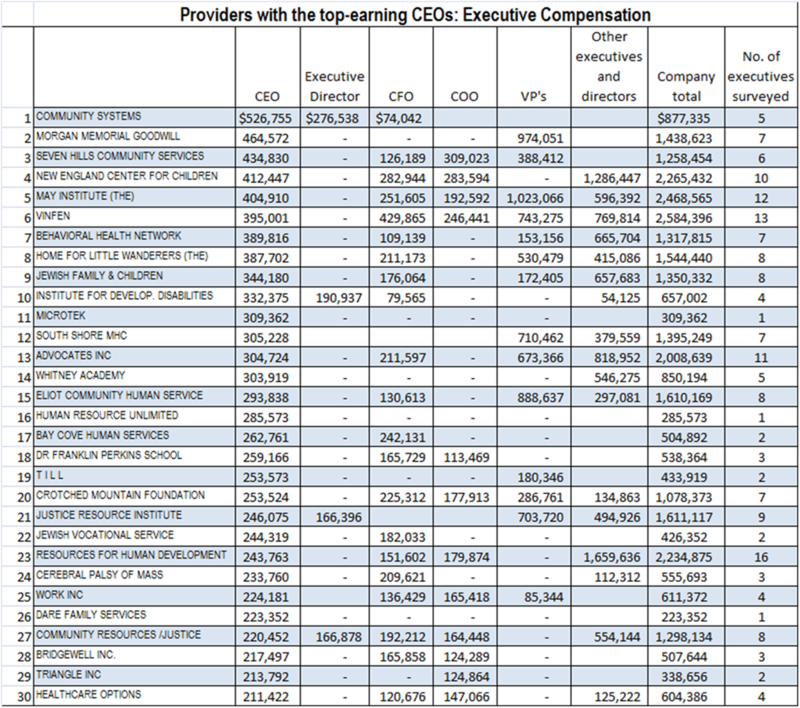 The following chart, based on COFAR’s survey of some 250 providers, shows 30 of the providers with the top earning CEOs (click on it to enlarge).